Earth tide (also known as body tide or bodily tides or land tides) is the displacement of the solid Earth's surface caused by the gravity of the Moon and Sun. Its main component has meter-level amplitude at periods of about 12 hours and longer. The largest body tide constituents are semi-diurnal, but there are also significant diurnal, semi-annual, and fortnightly contributions. Though the gravitational forcing causing earth tides and ocean tides is the same, the responses are quite different. Lunar tidal force: these images depict the Moon directly over 30° N (or 30° S) viewed from above the Northern Hemisphere, showing both sides of the planet. Red up, blue down. The larger of the periodic gravitational forces is from the Moon but that of the Sun is also important. The images here show lunar tidal force when the Moon appears directly over 30° N (or 30° S). This pattern remains fixed with the red area directed toward (or directly away from) the Moon. Red indicates upward pull, blue downward. If, for example the Moon is directly over 90° W (or 90° E), the red areas are centred on the western northern hemisphere, on upper right. Red up, blue down. If for example the Moon is directly over 90° W (90° E), the centre of the red area is 30° N, 90° W and 30° S, 90° E, and the centre of the bluish band follows the great circle equidistant from those points. 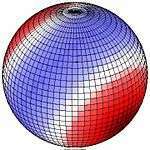 At 30° latitude a strong peak occurs once per lunar day, giving a significant diurnal force at that latitude. Along the equator two equally sized peaks (and depressions) are equally sized, giving semi-diurnal force there. Vertical displacements of sectorial movement. East-west displacements of sectorial movement. North-south displacements of sectorial movement. Vertical displacements of tessearal movement. East-West displacements of tessearal movement. North-South displacements of tessearal movement. Vertical displacements of zonal movement. Red up, blue down. The Earth tide encompasses the entire body of the Earth and is unhindered by the thin crust and land masses of the surface, on scales that make the rigidity of rock irrelevant. Ocean tides are a consequence of the resonance of the same driving forces with water movement periods in ocean basins accumulated over many days, so that their amplitude and timing are quite different and vary over short distances of just a few hundred km. The oscillation periods of the earth as a whole are not near the astronomical periods, so its flexing is due to the forces of the moment. The tide components with a period near twelve hours have a lunar amplitude (earth bulge/depression distances) that are a little more than twice the height of the solar amplitudes, as tabulated below. At new and full moon, the Sun and the Moon are aligned, and the lunar and the solar tidal maxima and minima (bulges and depressions) add together for the greatest tidal range at particular latitudes. At first- and third-quarter phases of the moon, lunar and solar tides are perpendicular, and the tidal range is at a minimum. The semi-diurnal tides go through one full cycle (a high and low tide) about once every 12 hours and one full cycle of maximum height (a spring and neap tide) about once every 14 days. 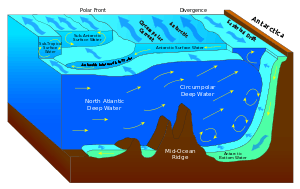 The classical theory of Earth tides first became established in 1909, primarily to explain nutations, but are also used in Earth rotation predictions. The semi-diurnal tide (one maximum every 12 or so hours) is primarily lunar (only S2 is purely solar) and gives rise to sectorial deformations which rise and fall at the same time along the same longitude. 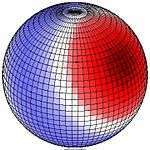 Sectorial variations of vertical and east-west displacements are maximum at the equator and vanish at the poles. There are two cycles along each latitude, the bulges opposite one another, and the depressions similarly opposed. The diurnal tide is lunisolar, and gives rise to tesseral deformations. The vertical and east-west movement is maximum at 45° latitude and is zero on the equator and at the poles. Tesseral variation have one cycle per latitude, one bulge and one depression; the bulges are opposed (antipodal), that is to say the western part of the northern hemisphere and the eastern part of the southern hemisphere, for example, and similarly the depressions are opposed, the eastern part of the northern hemisphere and the western part of the southern hemisphere, in this case. Finally, fortnightly and semi-annual tides have zonal deformations (constant along a circle of latitude), as the Moon or Sun gravitation is directed alternately away from the northern and southern hemispheres due to tilt. There is zero vertical displacement at 35°16' latitude. In coastal areas because the ocean tide is quite out of step with the earth tide, at high ocean tide there is an excess (or at low tide a deficit) of water about what would be the gravitational equilibrium level and the adjacent ground falls (or rises) in response to the resulting differences in weight. Displacements caused by ocean tidal loading can exceed the displacements due to the earth body tide. Sensitive instruments far inland often have to make similar corrections. Atmospheric loading and storm events may also be measurable, though the masses in movement are less weighty. Principal tide constituents. The amplitudes may vary from those listed within several per cent. ↑ A. E. H. Love, Proc. Roy. Soc. London, 82, 73-88, 1909. ↑ Paul Melchior, "Earth Tides", Surveys in Geophysics, 1, pp. 275-303, March, 1974. ↑ John Wahr, "Earth Tides", Global Earth Physics, A Handbook of Physical Constants, AGU Reference Shelf, 1, pp. 40-46, 1995. ↑ Sottili G., Martino S., Palladino D.M., Paciello A., Bozzano F. (2007), Effects of tidal stresses on volcanic activity at Mount Etna, Italy, Geophys. Res. Lett., 34, L01311, doi:10.1029/2006GL028190, 2007. ↑ IERS Conventions (2010). Gérard Petit and Brian Luzum (eds.). (IERS Technical Note ; 36) Frankfurt am Main: Verlag des Bundesamts für Kartographie und Geodäsie, 2010. 179 pp., ISBN 9783898889896, Sec. 7.1.1, "Effects of the solid Earth tides"
↑ User manual for the Bernese GNSS Software, Version 5.2 (November 2015), Astronomical Institute of the University of Bern. Section 10.1.2. "Solid Earth Tides, Solid and Ocean Pole Tides, and Permanent Tides"
↑ Accelerator on the move, but scientists compensate for tidal effects, Stanford online. McCully, James Greig, Beyond the Moon, A Conversational, Common Sense Guide to Understanding the Tides, World Scientific Publishing Co, Singapore, 2006. Paul Melchior, Earth Tides, Pergamon Press, Oxford, 1983. Wylie, Francis E, Tides and the Pull of the Moon, The Stephen Greene Press, Brattleboro, Vermont, 1979.